Book Cover: "A brilliant book which deals with the complex relationship between American Indians and animals, as it changed through time. Martin argues that an aboriginal ecosystem...was destroyed by 'European disease, Christianity, and the fur trade,' and the symbiosis which had existed between hunters and their game turned into an adversary relationship. -New Republic"
"The nature of the relationship between Indian and animal, he argues, was essentially a contract of mutual obligation and courtesy. When European epidemic disease began to ravage them, destroying perhaps 90 percent of the native population, Indians took it to be a 'conspiracy' by game animals against them. When their own medicine men were unable to cure these diseases, the stage was set for a 'war of retaliation'---the sacred agreement with the Keepers of the Game having been broken...There is a fine and fair mind at work here. -Harper's"
"The clarity, directness and originality of this small book should...earn it many readers, who will wonder at the tangled web of the living world and the variousness of the human mind. -Scientific American"
Taryn's Review: Sometimes when we look at history, we accept a certain idea as the absolute truth and then leave it alone. This acceptance, however, might cause us to overlook some fundamental questions that need asked regarding the truth that was constructed and accepted. Calvin Martin asked a fair question: Why else might have Native Americans participated in the fur trade other than for capitalistic reasons? 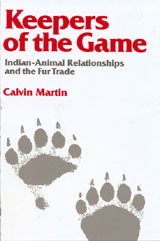 Martin's book provided a new view to look at the fur trade through: the Native American perspective. He focused mainly on the Ojibwa and their spiritual realm in the world before Europeans and how their views played into the acceptance of the fur trade. Martin used a lot of different sources, although maybe not as much native material (or studies) as I would have liked, but nonetheless, still valuable sources. He also focused on the despiritualization the natives experienced when the game was depleted and European diseases were taking an extraordinary amount of native lives. A great thing about this book is its readability. Martin presented his argument smoothly; I was able to read this book in one sitting without feeling dragged down by heavy words and unnecessary drivel. We had a great discussion in class regarding this book, so it opened up a lot of pathways to talk about. If you have an interest in the fur trade, Native Americans, or maybe even nature, this book might be up your alley.